One of the primary objectives of the IDEFICS study was to develop, implement and evaluate a setting-based community-oriented intervention programme in 2- to 9.9-year-old children in eight European countries (Belgium, Cyprus, Estonia, Germany, Hungary, Italy, Spain and Sweden). The baseline survey (T0)(see page “Study design & data collection”) took place in the intervention and control regions selected in these countries, enabling researchers to assess and describe the status quo of health and dietary and lifestyle habits of children in Europe taking into consideration regional, social, biological, and gender specific aspects. After this phase, the primary prevention programme was implemented only in the selected intervention regions, in which activities were offered for health promotion and prevention in kindergartens and schools. The short-term effects of the intervention were assessed during the second survey (T1) 2 years later, repeating the same examinations in children from both, the control and intervention areas, for comparison between both regions. A mailed questionnaire was completed by parents at T2 to assess the sustainability of the intervention. 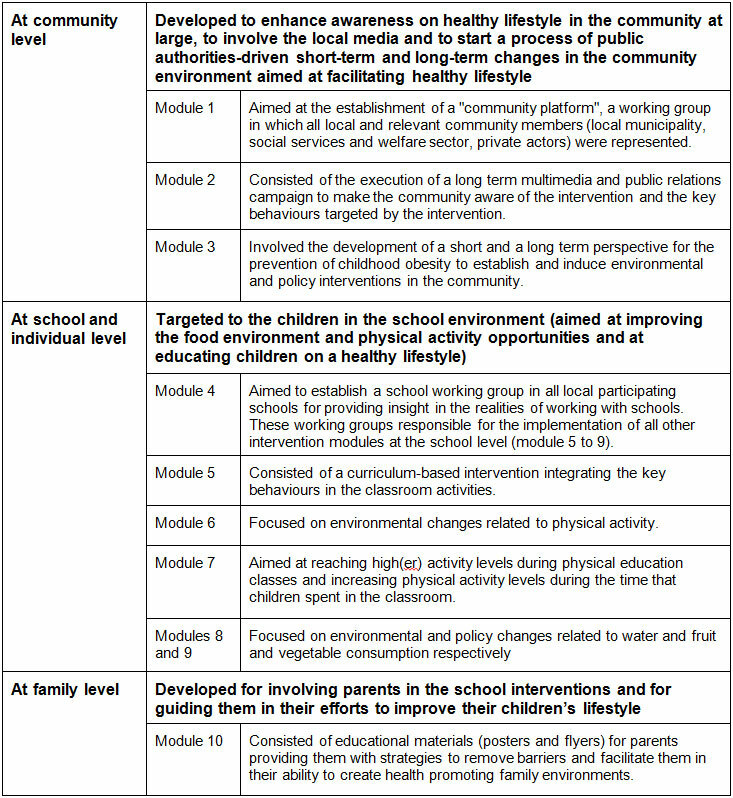 The intervention was designed to address key obesity-related behaviours (diet, physical activity and stress) in 4 levels: individual (children), family (parents), schools and community. Six messages, related to these behaviours were delivered through 10 modules targeted across all the levels. Verbestel V, de Henauw S, Marild M, Storcksdieck S, Fernandez Celemin L, Gallois K, et al. 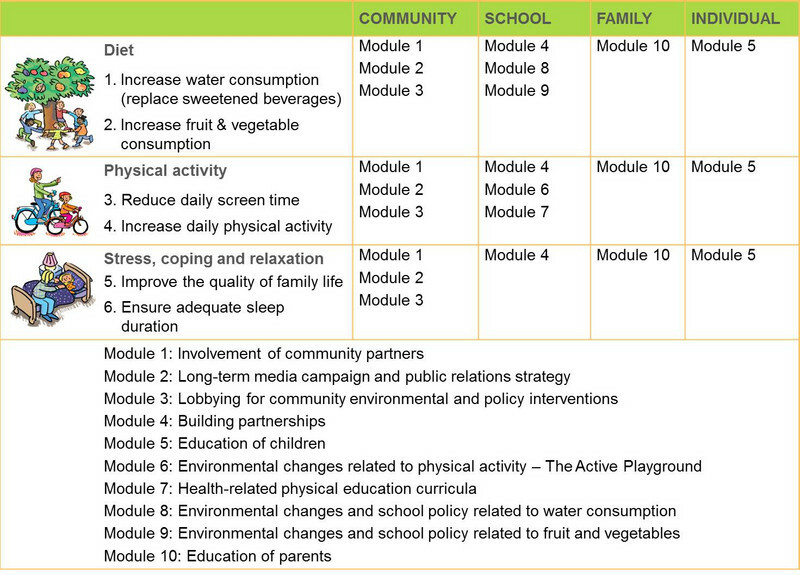 The IDEFICS intervention toolbox - a guide to successful obesity prevention at community level. Public Health - Social and Behavioral Health2012. p. 3-40. Verbestel V, de Henauw S, Maes L, Haerens L, Marlid S, Eiben G, et al. Using the intervention mapping protocol to develop a community-based intervention fpr the prevention of childhood obesity in a multi-centre European project: the IDEFICS intervention. Int J Behav Nutr Phys Act. 2011;82(8). In December 2015 a special issue titled “Prevention of childhood obesity: Results from the IDEFICS study” was published by the journal Obesity Reviews. 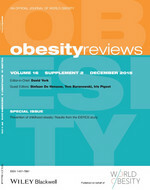 All articles can be found (OpenAccess) at the archive of the journal Obesity Reviews here.